Click to preview and buy. This book is in the calibre of books by Joyce Meyer. A must read for every woman, and the men who love them. I ‘trip’ for the book! This book is a great treasure, and a source of tremendous blessing. Each chapter holds its own gem! For the first time in a long while, I spent a sleepless night, reading SISTER MINISTER. People don’t know what they are missing by not reading the book! I don’t usually read but as soon as I picked SISTER MINISTER with the sole intention of just browsing through, I couldn’t put it down till I had finished it! 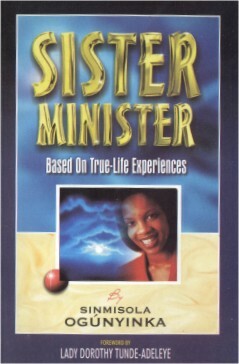 Sister Minister is a combination of different true-to-life stories that affect women in different walks of life. The stories teach different lessons and expose us to life’s teachings. This is a book that brings women’s experiences in different lights and also seeks to help us identify with the challenges we face daily, and ways of overcoming always. Though targeted at women, married and unmarried, it will also help the man, married and unmarried, to know what to expect in the woman God uses, and also to understand how they can encourage the manifestation of God’s kind of life in the woman.